A teenager from Co Antrim was among a group of about 15 young people caught up in the unfolding calamity in Belgium. Clare Caulfield said that her daughter Shealyn, aged 17, had arrived at Brussels airport on Tuesday morning shortly before a bomb detonated. She and the rest of the group are understood to be unhurt. However, the pupil of St Patrick’s in Ballymena has a rare heart condition and has recently recovered from surgery, and could be susceptible to shocks. 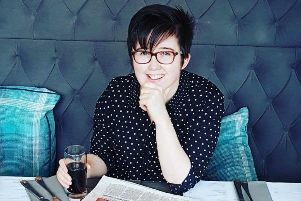 She was part of a group from Newtownabbey, Ballymena and Ballyclare who had travelled with the Ballymena Youth Council on a fact-finding trip to the continent. She said she had travelled out from Northern Ireland on Friday, and was due back today. “She texted this morning [just after 6am] to say that they missed the first train to the airport. They missed that train – thank God. “They got into the airport and the bombs went off, and they had to be evacuated. “At that stage, I knew nothing about it. I was in spin class in the gym. I happened to look over to the left and saw all this running on the TV. She said she has a mechanical aortic valve, and described her health condition as “really severe”. She had been considering not going on the trip, but her mum – a representative of Unite the union in Ballymena – persuaded her. “Here’s me making her go away!” she added. Shealyn had told her the situation was “bedlam, everybody running, everybody out down the street”. After the initial blast, a second bomb then went off. The last she heard from her daughter, who is in fifth year, was that she had taken refuge in a pub and was “playing cards with a lot of French travellers”. Their leaders are understood to be with them.